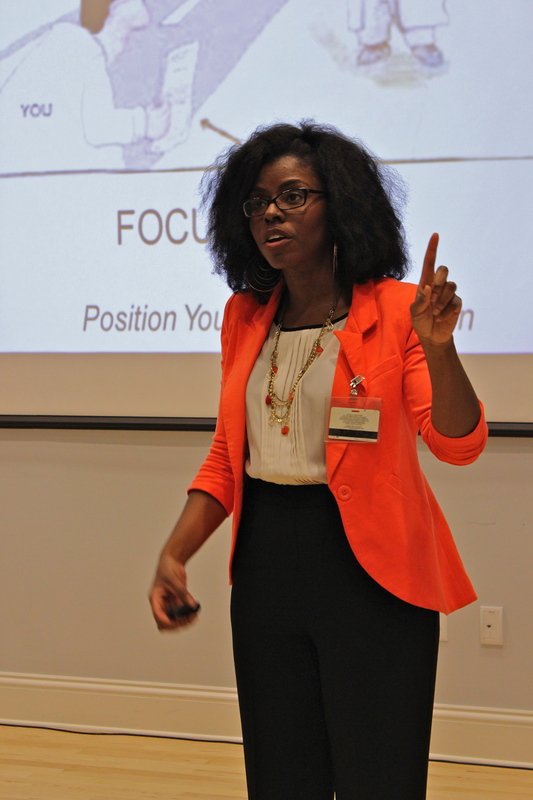 “You have the power to position yourself for a promotion” stated Julia Winston ’02, during her recent talk, “Network 2 Careers.” This week, the alumna returned to Randolph armed with advice and strategies for finding success in any career. Winston works specifically to develop leaders within underrepresented groups and is particularly passionate about helping women find success in their careers. After graduating from Randolph-Macon Woman’s College with a degree in communication studies, Winston took several years to discover her true passion. She earned a masters in education with an emphasis in human resource development, and in 2006, became certified in executive coaching. She then created Brave Communication LLC, an executive coaching and leadership development firm. During her presentation to the Randolph community, Winston outlined five reasons under-represented groups do not get promoted, none of which related to their under-represented status. She then explained seven steps people should take to position themselves for a promotion. “You will find what you look for,” Winston said, adding that that looking for a promotion is better way to be successful than looking for excuses. “You don’t have the basic skills” needed for advancement, or lacking the knowledge of what skills will be needed in the future. “You act your wage.” Earning a promotion requires maturity and behavior that surpasses that of any entry-level position. “Your Lack of people skills.” A promotion requires working well with everyone, especially the people you don’t get along with. “You don’t mind your business.” A promotion requires understanding the present trends and what businesses will need in the future. “You didn’t ask.” When you do ask, do it because you are an investment in the company’s future. Defining your vision: know what is valuable to you, and why it is worth your time and investment. Learn your business: study the “top dogs” in the industry and understand what you can offer your company in the future. Set objectives based on your vision and your company’s needs. Identify people who can promote and sponsor you: surround yourself with a diverse group of people who will advocate for you with multiple perspectives. Manage your distractions: promoting yourself demands focus. You cannot let guilt, fear, family, or friends distract you from achieving your dreams. Communicate your results: explain why your actions are, and will continue to be, a benefit to the company. Repeat: success is not guaranteed on the first try, it requires determination and persistence. Winston also stressed that leadership is about other people. To earn a promotion, you must understand why that promotion will benefit you and the company. She urged those listening at her talk to take action and promote themselves. “your curiosity is your greatest asset…you have to take the first step,” she said.